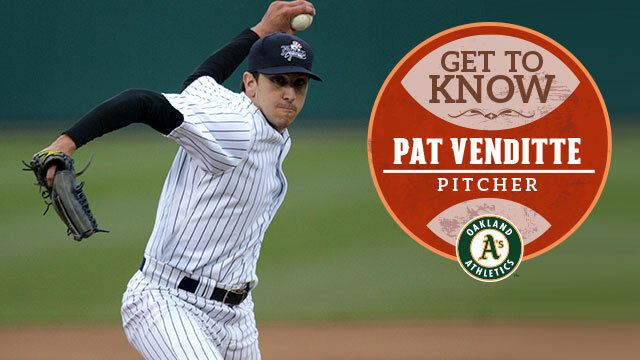 Pat Venditte was selected by the New York Yankees in the 20th round of the 2008 draft. The hurler spent the past seven seasons in the New York organization, but signed with Oakland as a minor league free agent in November 2014. He is the only ambidextrous pitcher in professional baseball today, and could go down as the most unique player to ever don a Nashville Sounds uniform. Venditte is naturally right-handed but ever since he was three-years old, the pitcher has been throwing with both hands. He takes the mound with a specially-crafted six finger glove which allows him to switch pitching hands with ease. Click here to read more in their great piece about him. Now, only 7 years after his 2008 viral success, the 30 year old who’s now pitching with the Oakland Athletics, is about to break into the majors. Keep an eye out for the ambidextrous hurler during Oakland’s next game against the Boston Red Sox this afternoon at 4:10. Considering Pat’s sub 2 ERA, things could get very interesting. Given that there hasn’t been a “switch-pitcher” since 1882, it will at the very least be historic.